This fly was developed by Dan Byford in the early 1970’s. It's effectiveness is enhanced by the rabbit strip that is used for the wing. 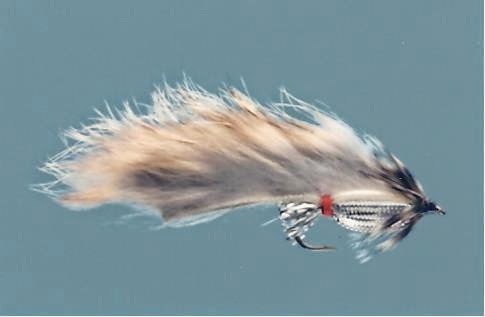 The soft, flowing rabbit fur wing (Zonker strip) helps to suggest the movement of minnows. The wing color can be varied for different types of fish, and a red throat can be added to suggest gills. It's an excellent bass fly that works well in both lakes and streams. It's effective for trout, bass and other species. Step 1. Cut a section of Mylar about hook length and remove the cotton string. V-cut both ends of the rabbit strip. Step 2. Wrap a wool underbody and slide that mylar cover over it. Leave the thread hanging in place. Step 3 and 4. Secure the mylar with tight wraps and tie in the rabbit strip with the tips toward the rear. Reattach the thread 3/16 inch from the eye and tie in the front hackle. Step 5. 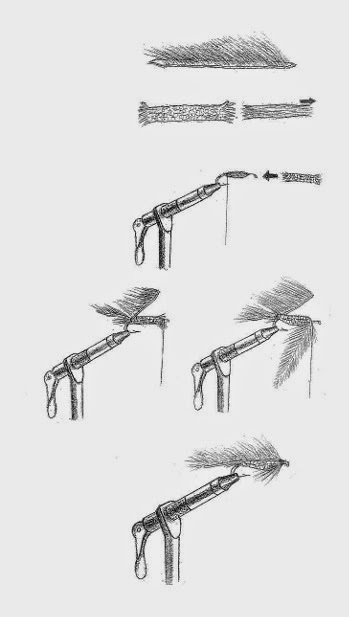 Make 3 or 4 turns of hackle and wrap back over it to form a 45 degree angle. Pull the rabbit strip over the top of the hook and tie it off. Finish the head and cement.